Who would have thought that you can make this wonderful delight at home! I know you are thinking – snails, but don’t cheat yourself of one of life’s luxuries – try them. They can generally be found in grocery stores next to the canned tuna. There are a couple of different serving options for this recipe. One is a special serving piece that holds six escargots and makes for a lovely presentation (pictured below). The other is a 6 oz. ramekin that also holds six escargots. Lemon Infused Extra Virgin Olive Oil is being used and can be purchased on-line at Spicewood Food Company. Make puff pastry by taking one sheet and cutting according to the dish you are using. For a ramekin it will be larger about 6 inches in diameter, for the dish I am using it will be about 3 inches in diameter. If you have kids, break out a cool play dough cutter and use it as I did! Wash it before using to remove any play dough. Otherwise use a round object to cut around, such as, a shot glass or any other type of glass. Place pastry on a cookie sheet and bake in a preheated oven at 400 degrees for about 6 minutes for the small ones and about 10 minutes for the larger ones. Check often so they do not burn. Remove and set aside. 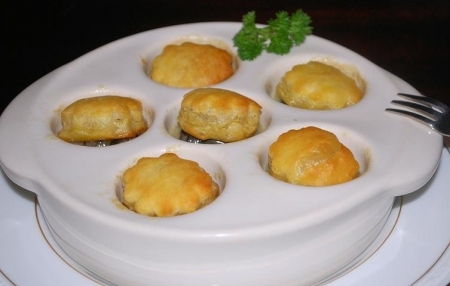 Make escargots, by melting butter in a medium sauce pan over medium heat. Add garlic and escargots and bring to a gentle boil. Remove from heat, add lemon infused olive oil and stir to incorporate. Place in container of choice and top with puff pastry. Serve and enjoy! Try J. Lohr Arroyo Seco Riverstone Chardonnay (California), Rodney Strong Chardonnay (California), Ferrari Carano Chardonnay (Alexander Valley) or Irony Chardonnay (Napa Valley).